Bret Kindall’s passion for agriculture started when he was 10 years old. Ten years later, he is a sophomore at the Univer­sity of Idaho, double majoring in agricultural education and horticulture in the College of Agricultural and Life Scienc­es. He plans a career as an ag teacher for high schoolers and a FFA advisor who focuses on plant sciences. “4-H and FFA were what sparked my interest,” said Kindall, 20. Growing up in Cambridge, Idaho, Kindall showed market lambs in 4-H, which made for an easy transition to bigger and better things like FFA. 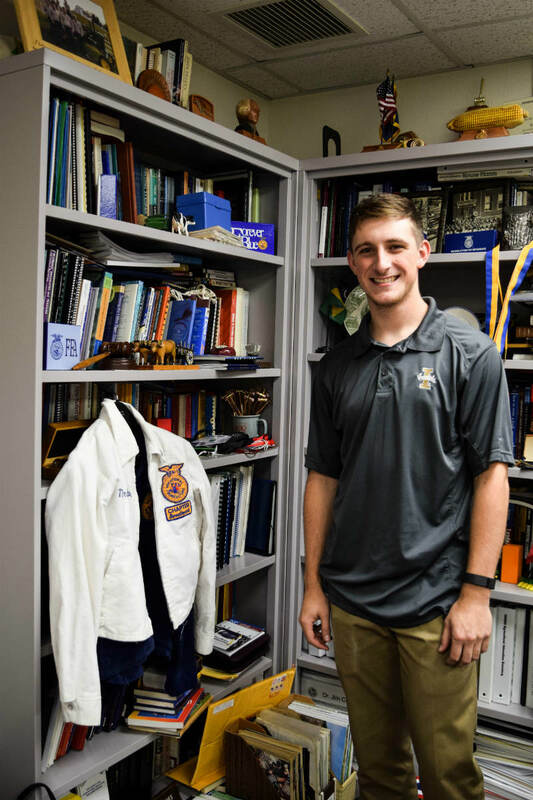 While in FFA, he competed on many different teams and went to nationals for two different competitions; he won first and third — win­ning cash and an engraved plaque and getting to walk across the stage at the National FFA convention. This year he received his American Degree, the highest level of degree possible in FFA. After years of competing in different FFA events hosted at UI, Kindall got used to the campus and really liked it. 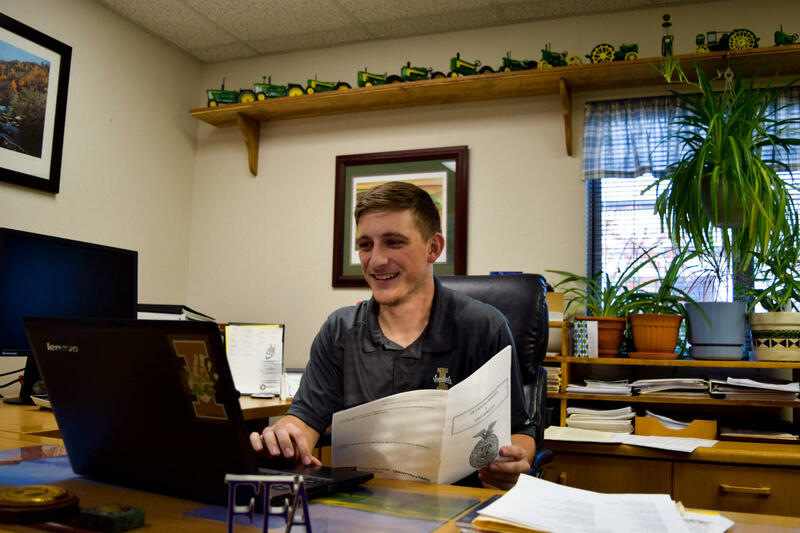 “I decided that since I already knew the campus and they have such a great ag program, UI was the best fit for me,” Kindall said. Jeremy Falk, an assistant professor of agricultural education, ap­proached Kindall about studying different teaching styles of FFA advisors. Kindall had previously expressed interest to Falk and other faculty members about wanting to conduct undergrad research. Since Kindall had competed at the national level and likes competition, he was interested in better understanding the different styles. Kindall shows off his FFA jacket. He has been in FFA since he was 10 years old. Falk and Kindall teamed up, along with another student, to develop a plan to conduct their research and analyze the results. They collected information about six different types of teaching styles. They picked a series of questions to put into survey that they handed out at nine different contests at FFA nationals. “For an entire day we ragged on advisors and students to do our sur­veys by just handing them out to everyone and giving them a sticker with the FFA crest on it,” Kindall said. There were two different types of surveys: One examined how the students felt their advisors praised them, and the other assessed how the advisors behaved in response to their students’ performance. Based on the answers, Kindall and his fellow researchers can analyze the style of teaching for each advisor or coach. From that information, they are trying to determine if one teaching style has a winning or losing rate or if there seems to be any correla­tion. They also are interested to see if there’s any correlation between the teaching styles of coaching students for contests versus coaching for team events. So far, the researchers have 3,000 surveys and are putting in the work to analyze them. Each survey takes about three minutes to review. “I hope that from analyzing the results I can learn, and one day use, the best teaching styles to have successful teams,” Kindall said. Kindall studies how coaching strategies lead FFA students to success, and hopes to someday be a coach himself.